← Bursary Fund now open! 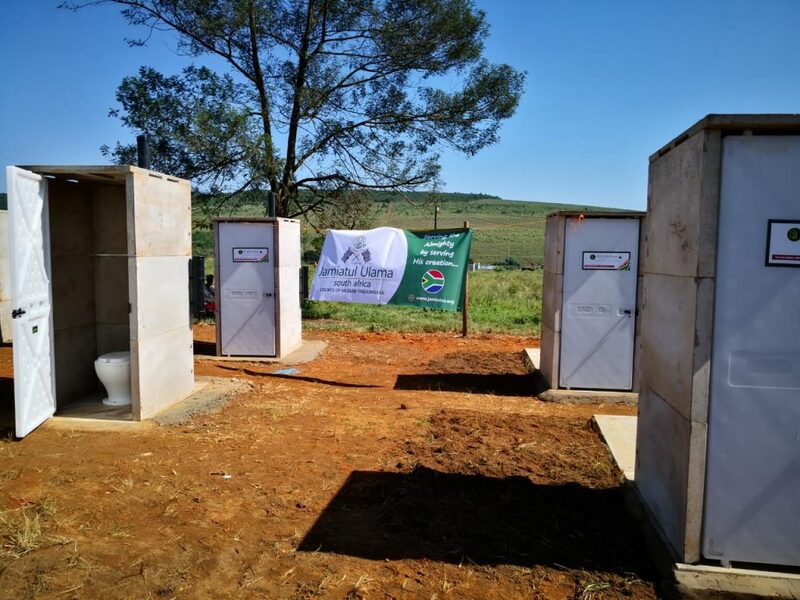 On Wednesday, 13th March 2019, half a dozen toilet cubicles were handed over to Enseleni Primary School, situated on the outskirts of Kranskop in the KZN Midlands. This is an initiative of the Jamiatul Ulama South Africa (JUSA), in partnership with the Gift of the Givers, in order to make the schooling environment safer, hygienic and conducive to learning. A number of learners have perished over the years after falling into unstable or unsecured pit latrines, while answering to the call of nature. In spite of the alarming headlines, highlighting the gravity of the situation of school sanitation facilities over the years, the reality is that not much has changed on the ground, especially in rural parts of the country. The Eastern Cape, KwaZulu-Natal and Limpopo, top the provinces with the highest number of either pit latrines or inadequate sanitation facilities. After 25 years of freedom and walking down the democracy lane, more than 4,000 schools across the country still use and rely on pit latrines that are often unsafe for young learners. It is our responsibility to ensure that the next generation does not have to risk fatal outcomes in the toilets while accessing basic education. It is estimated that close to R7 billion will be required to eradicate pit latrines from South African schools. President Cyril Ramaphosa has personally called upon the private sector as well as other stakeholders to join hands with government in order to eradicate such unsafe facilities in schools. Welcoming the delivery of the cubicles, several educators at the school expressed their extreme jubilation at what in their own words termed as a “God-send gift.” They enumerated a host of challenges that come with inadequate sanitation facilities at the school. Young learners are at times too scared to relieve themselves utilising a pit for fear of falling in. This causes them to either mess themselves up or attempt to relieve themselves elsewhere, in a very unhygienic fashion. Insufficient clean-water supply, malnutrition, overcrowded classrooms, poor quality health care and children being taken care of by aged grandparents, are among the many hurdles to quality education faced by children in rural communities. Since there is no running water available at Enseleni Primary School, four VIP (Ventilated Improved Pit) toilets were installed. This concept is a step above the regular pit latrines and conforms to the minimum standard as specified in the guidelines of the Department of Education. A VIP toilet is a freestanding unit that sits on top of the pit with a seat above the ground. There is an outlet from the pit which allows for ventilation, thereby reducing smell build-up within the closet. In addition, two Pour-Flush cubicles were also installed. In this system, the seat is not directly above the pit but located beside it. A jug of water is used to flush down the waste so as to keep the bowl clean. Similar to a septic tank, the pit allows for the waste to be extracted, if need be. The Jamiatul Ulama South Africa intends to extend this project to many other rural schools across the country. The primary motivation is to enable education to be accessed with greater dignity. An improved learning environment enables better education which in turn translates into a healthier society.